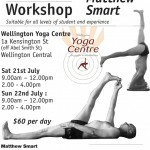 If you live in or close to Wellington, and are a serious student of yoga, there’s a seminar coming up that you won’t want to miss. 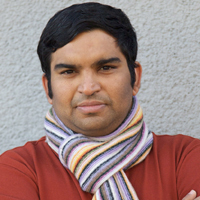 Kausthub Desikachar, son and student of TKV Desikachar, grandson of the great Yogi, T. Krishnamacharya is coming to Wellington to deliver the fourth in a series of in-depth seminars on the Yoga Sutras. This series is highly recommended for Yoga teachers of all levels and lineages, as well as anyone interested in pursuing the philosophy of Yoga in their personal and professional life. It doesn’t matter in the slightest if you’ve missed the previous three seminars either. This seminar will look at Chapter Two of the sutras, which covers the Method of Yoga. It describes the qualities necessary to change the mind effectively and gradually, why these qualities are important and what the practice of them entails. The Yoga Lunchbox was fortunate enough to be able to interview Kausthub despite his busy teaching and working schedule. See below for details on the seminar. 1. You grew up in a family with a strong lineage of yoga, and your parents allowed you to find you own way to the practice. Can you remember when you knew that studying and teaching yoga was what you really wanted to do? I was already a student of yoga and a teacher when I was a young child. I have been teaching children since I was maybe 12-13 years old. But I did not have a serious wish to take up to being a full time student and teacher of yoga until I completed my university, when I was 21. It was when I returned home after completing my Master’s degree that I felt this calling. 2. What is yoga about and has these changed down through the ages? Yoga is about a way of living. It was intended for at least three fundamental purposes. Health, Healing and Spiritual transformation. All of these three have an influence on the way we live and this was the place for yoga. Its unfortunate today that yoga is mostly seen as a physical practice. I hope and wish this will change, and I hope to be a part of this paradigm change. 3. There’s a wonderful quote of yours I read in an interview you did for Ascent Magazine ‘The body is the temple of the spirit, but you don’t go to the temple only for the architecture‘. How does this apply to yoga and the way it’s taught or studied? Yes, basically you don’t come to yoga only for the development of the physical body. There is a deeper search, be it conscious or not, in everyone coming to yoga for something more deeper. Hence you must go beyond and try to see how yoga can influence us at a more deeper level, be it mental, emotional or our spiritual domain. 4. Your father says that yoga is relationship – what does this mean and is this something that you believe too? Absolutely. I think what he means is that through yoga you develop a more positive and appropriate relationship to every layer of our self, and therefore we can extend it to others as well. This is a true measure of success in yoga. Its not about how well we do its tools, but actually how all of our relationships become better. 5. And finally, what is the difference between a yoga student and a yogi? Is there a difference? A yoga student is in the process of learning yoga. A yogi is one who lives a life of yoga. Cost: NZ$ 325 Participants of the KHYF Yoga Therapy Program will be offered a 10% discount if registering on or prior to July 15, 2010. Registration is limited. Reserve your place as soon as possible. Calligraphy Yoga combines the principles of Tai Chi, Qi Gong, Indian yoga and Chinese Calligraphy to create a flowing practice of unbroken natural movements.